I'm so excited to announce my newest release is available now! 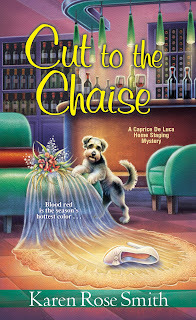 CUT TO THE CHAISE, my eighth Caprice De Luca Home Staging mystery, is a cozy mystery which revolves around Caprice's and Grant's wedding. It is available online and in bookstores. Join me for my Facebook launch party tonight (November 29, 2018) from 7 to 9 p.m. EST. There will be chat, prizes and details about CUT TO THE CHAISE. Please click HERE to access my KarenRoseSmithBooks author page for the party. Caprice De Luca and Grant Weatherford are getting married! 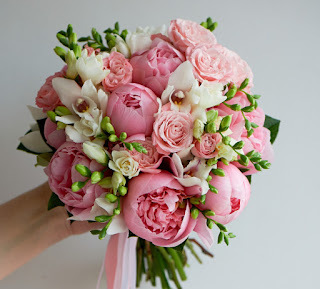 They are supposed to have their reception at a local winery, Rambling Vines, that Caprice's brother Vince, an attorney in Kismet, Pennsylvania, recommends and Caprice has decorated. But a few weeks before the wedding, the winery owner, Travis Dodd, is murdered in the tasting at Rambling Vines. His wife Michelle, an old flame of Vince's, asks for his help when she's taken to the police station for questioning. It's quite possible that Caprice's best friend, Roz Winslow, will have problems with Vince helping an ex. Their live-in relationship might not hold up under the burden of Vince advising a woman he was once involved with. 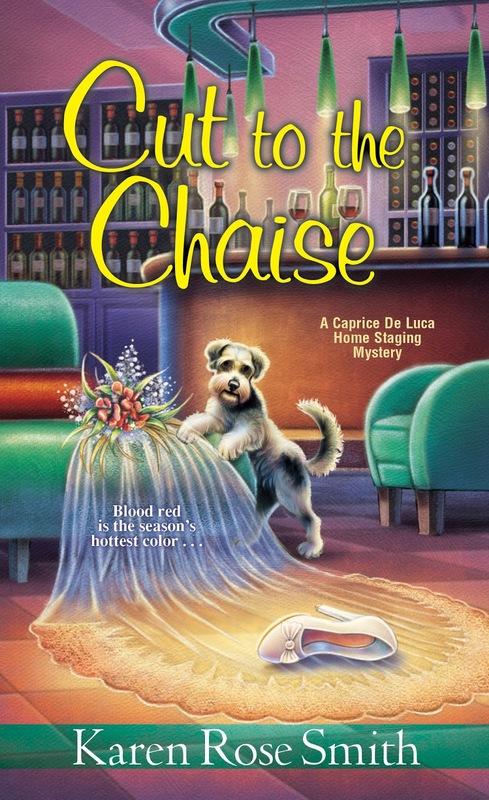 Caprice intends to make sure her brother's romance doesn't hit a speed bump by solving this murder mystery quickly...before her marriage to Grant. Caprice uses peonies in her wedding bouquet.